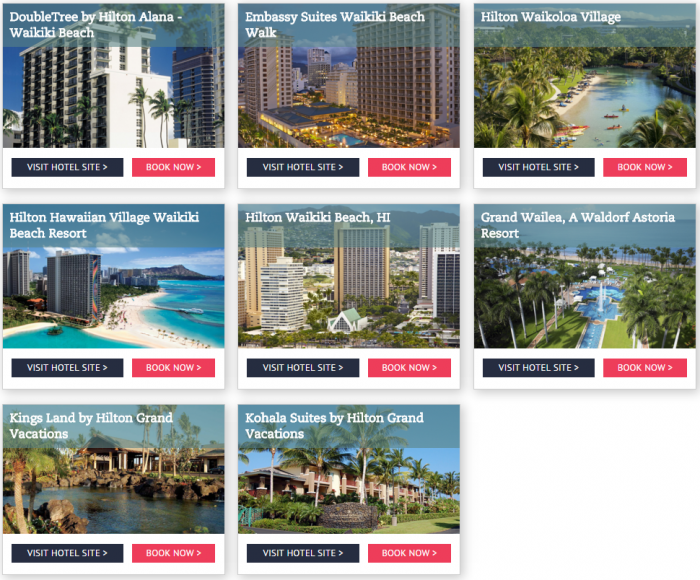 Hilton HHonors has launched a bonus airlines miles rate at select hotels in Hawaii for stays March 4 – June 30, 2016. You can earn 500 bonus airline miles per night (select airlines) and you must book a specific “Bonus Miles Package” rate that is likely higher than other rates available. Note that there is a list of non-participating airlines at the terms and conditions. Also, there are some airline and Hilton hotel brand specific differences on number of bonus miles earned. Buying airline miles using these “Bonus Miles Package” rates is usually no win situation unless someone else is paying for your stay or there are no discounted rates available. Offer is subject to availability at participating Hilton Worldwide portfolio of hotels & resorts in Hawaii and valid for stays booked and completed between March 4 and June 30, 2016, (“Promotion Period”). To be eligible for this offer, you must (1) be a member of Hilton HHonors™; (2) have a preferred airline selected in your HHonors profile; (3) book the “Bonus Miles Package” or Plan Codes PGBML1/M1L and (4) complete a stay at one of the participating properties. Rates do not include taxes, gratuities, incidental charges or resort fees (if applicable). Each hotel’s change and cancellation policy varies. Please contact the individual hotel to confirm its policy. Offer components are non-transferable or redeemable for cash, and cannot be applied toward future stays. This offer may not be combined with other select promotions, offers or discounts and is not valid for groups. Other restrictions may apply. If you are making this reservation by phone, please call our Internet Customer Center at +1-800-HHONORS or view a complete list of Hilton HHonors Reservations phone numbers. When booking by phone, please request “Bonus Miles Package” or Plan Codes PGBML1/M1L. Bonus Mileage: Earn 500 bonus miles, points or kilometers (depending on the airline program, with exceptions noted below) per night at participating Waldorf Astoria™ Hotels & Resorts, Conrad® Hotels & Resorts, Hilton Hotels & Resorts, Curio – A Collection by Hilton, Embassy Suites Hotels by Hilton™, DoubleTree by Hilton™ hotels and Hilton Grand Vacations™. On select airlines, bonus miles vary, as follows: Aeromexico: 1000 kilometers; Air Miles: 25 miles; Deutsche Bahn: 250 Miles; El Al Israel: 12 Points; Iberia: 750 miles; JetBlue: 250 Points; LAN: 1000 kilometers; Virgin America: 250 Points; and Virgin Atlantic: 1000 miles. For details on the participating airlines, please click here. The following airlines are not participating in this offer: Air Asia Big, Air China, Air New Zealand, All Nippon Airlines, Asiana Airlines, Eva Air, British Airways, Cathay Pacific Airways, China Eastern Airline, China Southern Airlines, Garuda Indonesia, Hainan Airlines, Japan Airlines, Jet Airways, Korean Air, Malaysia Airlines, OK Cashbag, Qantas, Sri Lankan Airlines, Singapore Airlines, Thai Airways International, Vietnam Airlines and Virgin Australia. Please allow up to six weeks for bonus mileage to be credited to your HHonors account. Next articleSPG Dashboard Promotion: Points Posting For 5/11 Brands Promo !